A-wonderful! A-wonderful! 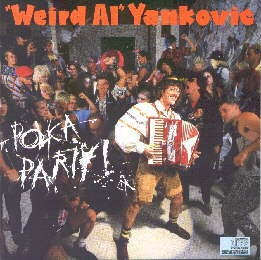 A-"Weird Al" Polka Party! Production Summary: All ten songs were written and recorded specifically for this album. Dr. Demento Status: Nine of the album's ten songs have aired on the syndicated Dr. Demento Show, with the last song to premiere on the show being "Good Enough for Now" on March 1, 1987. By the time The Dr. Demento Show ended its run on terrestrial radio on June 5, 2010, "Don't Wear Those Shoes" remained the only song from the album never played on the program. Interestingly, "One of Those Days," "Toothless People," and "Good Enough for Now" have each only been played on the broadcast version of the show once. Tour Status: As of this update, 70% of this album has been included on a regular tour setlist. Out of Al's studio albums, this one has the fewest number of tracks. Ties with Dare To Be Stupid, the UHF soundtrack, and Alapalooza as having the fewest number of parodies of any ALbum, four. Only one parody from the album became a single, a record low for parodies off an Al album until 2003, when no parodies (or originals, for that matter) off Poodle Hat were released as singles. The brand and model of the copy machine the band used to take their sleeve/booklet photos with? Why, a Sanyo 1200ZF of course, you dolt! Etched onto Side 1 of most copies of the LP: "Polka 'Til You Puke." On Side 2: "Where's My Liquid Paper?" For some reason, after the release of the original CBS CD, all subsequent CD reissues skip the first beat in the song "Toothless People." The full opening would finally be restored when the album was remastered for 2017's Squeeze Box: The Complete Works of "Weird Al" Yankovic. ALbum title/song connection: "Polka Party!" is the album's polka medley. Debuting at #188 in Billboard, this album had the worst debut of any of Al's work since his debut album. It would stay on the "Billboard 200" chart for only four weeks. To see the original CBS CD's booklet in its entirety, check out Happy Steve's scan collection! Released in Japan on January 21, 1987. Polka Party! ©1986, 1990 Scotti Bros. Records. ©1999 Way Moby/Volcano Entertainment III.